The Disaster Monitoring Constellation (DMC) is a novel international co-operation in space, led by SSTL bringing together organisations from seven countries: Algeria, China, Nigeria, Thailand, Turkey, the United Kingdom and Vietnam. The DMC Consortium is forming the first-ever microsatellite constellation bringing remarkable Earth observation capabilities both nationally to the individual satellite owners, and internationally to benefit world-wide humanitarian aid efforts. BILSAT experiments include two payloads designed and built by SSTL's Turkish customer, TUBITAK-ODTU-BILTEN. 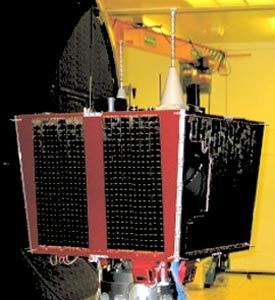 The first, named COBAN, is a nine-band low resolution multi-spectral imager. The second, named GEZGIN, is a DSP based image processing module that uses the JPEG2000 algorithm to compress images taken by BILSAT-1's on board cameras. Both of these payloads were designed and built by BILTEN engineers in the context of the KHTT (Know How Training and Transfer) programme that ran in parallel with the BILSAT project.